Credit Suisse Standard Securities precious metals analyst David Davis has issued a warning for gold. 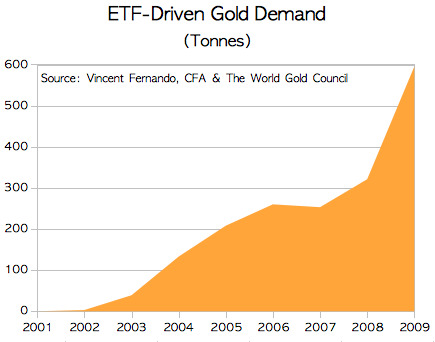 Basically, the market experienced a surge of gold ETF buying over the last year, which became the key driver for gold prices. It wasn’t like this back in the pre-ETF days mind you, this is how the gold market has changed dramatically into something far more speculative than it used to be. “We believe that a major problem is looming on the horizon should investment demand remain muted and/or should investment demand start falling away over the next three to five months,” he said in a research note. ETF demand was 85% higher for 2009 compared to the previous year at nearly 600 tonnes, driven largely by a strong performance in the first quarter. This demand dropped off sharply by the fourth quarter of the year, coming in two thirds lower compared to the same time a year earlier. “We are of the view that there is increasing downward risk to the gold price should the pace of sales increase. We estimate that institutional divestment alone has the potential to release between 200 tonnes and 300 tonnes in 2010,” Davis said.